Imagine a world in which Japan is a major player in the world of space exploration. Now imagine a horrible tragedy befalls their program, making the Challenger explosion look like a fender bender. This is the world in which Asumi lives, yet there is still hope for those, like her, who want to explore the stars. A new space program is beginning, but getting into it will be tougher than she can imagine and involves bringing up parts of her past that Asumi may not even be aware of. Join us on a voyage of discovery that is...Twin Spica. I think Vertical might have the corner on the market on manga that is seinen but doesn't feel like the seinen we usually see in an English translation. This is the story of a girl facing her fears and dealing with the jealousies and friendships involved in being a teenager, which is usually more shojo fare. However you want to slice the marketing, this is a very good manga that captured my interesting right away. From the first moment we meet Asumi, the reader knows she has a problem. Since this is set in the real world, a girl who talks to a humanoid lion is no ordinary girl. (The secret behind the lion is a clever one, and I won't reveal it here.) She's far more determined than the usual schoolgirl heroine (a reason why this is for an older audience, perhaps?) and refuses to let anything stop her from achieving her goal. Asumi's probably too small, possibly too weak, and has a definite psychological issue, but yet I can't help but believe that she's going to find a way to reach her goal. Whether reaching it will satisfy some of her demons is another story entirely. Despite the somewhat lighthearted nature of the story so far (a teen overcoming obstacles to make it in the world), there are definitely some dark undercurrents that give the story depth. Yaginuma's characters are complex, with problems that lurk just below the surface, waiting to come out. Asumi's companions are flawed, and those flaws will either help the space mission--or doom it to yet another failure, like the one that came before. There is a lot of setup in this first volume, so it's hard to tell quite where the story is going. Vertical includes two short stories that follow the same concept, but I don't think either is a real blueprint for where we are going. I loved the first pilot story, which I think is one of the better short stories I've read in a manga collection. The second is a nice variation on a ghost story, with Asumi caught between the worlds of the living and the dead. Both show that Yaginuma's plotting ability is quite strong, so we as readers should be in for a treat in the longer story. One of the things I really liked about this first volume is Yaginuma's use of camera angles when drawing. Some manga stories are pitched pretty straightforward, with a static view of the action. Instead of this, Yaginuma keeps his figures on edge, tilting the viewer's eye by positioning the bodies in such a way that there is a lot more implied movement and stress. Though the drawings are clearly in the style of manga we've come to expect from Japan, their placement and use is more varied than I tend to see in the Japanese comics that I read. I'm not trying to read a lot of new manga series this year since I have so many to complete right now. Twin Spica, however, is well worth adding to the list. 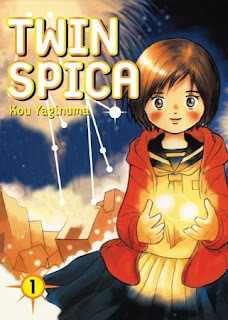 With complex characters, excellent art, and a compelling story about the desire to reach your dreams no matter what the cost, Twin Spica is a must read for both manga fans and those who still look up at the night sky with a sense of wonder. I'm definitely looking forward to reading more.